It's getting colder and colder out. The cars, grass, rooftops and streets are all starting to have frost on them. I'm kind of getting excited even knowing that Fall will be gone soon and Winter is around the corner. Winter brings in my birthday, Christmas and New Years back to back, so December is always busy for us with family dinners, parties and lots of activities the kids get invited to. 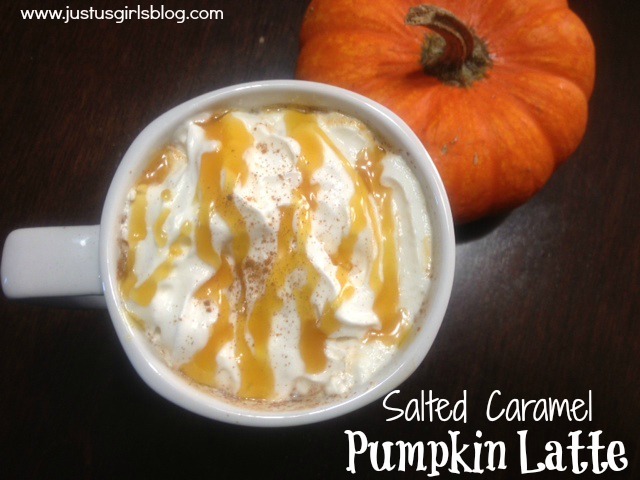 Today's Thirsty Thursday is one of my favorites, Salted Caramel Pumpkin Latte. Have you ever tried the ones at Starbucks? They're delicious, sweet and are addicting, which could end up costing you an arm and a leg. Thank goodness I live about twenty minutes from one, otherwise I know I'd be there now, lol. I've been in the mood for one of these since the beginning of Fall and found tons and tons of recipes on how to make one myself via Pinterest. It took a while, but I finally found one that I absolutely love from over at Inside BruCrew Life. It's not hard to make at all and takes all of seven minutes. Although I love the ones at Starbucks, the ones I make myself are so much better and cheaper. Can't beat that! In a small saucepan mix in your milk, canned pumpkin, caramel and vanilla. Stir and bring to a boil. Divide mixture between two large coffee mugs and add in 1/2 cup of coffee to each mug. Top with whip cream or cool whip caramel drizzle and sea salt. Serve, drink and enjoy!